2. In a small skillet, heat the ghee. Once hot, add in the apple slices and cook until softened. 3. Once soft, add in 1 TSP honey, grated ginger and cinnamon. Continue to cook for about 5 minutes. 4. In a small bowl, whisk together the whisked eggs, almond milk, almond flour, coconut flakes, vanilla and sea salt. 5. Pour batter over the apples and and let cook for 2 minutes. 6. Transfer skillet to the oven and let cook for 5-10 minutes, or until cooked on top. 7. 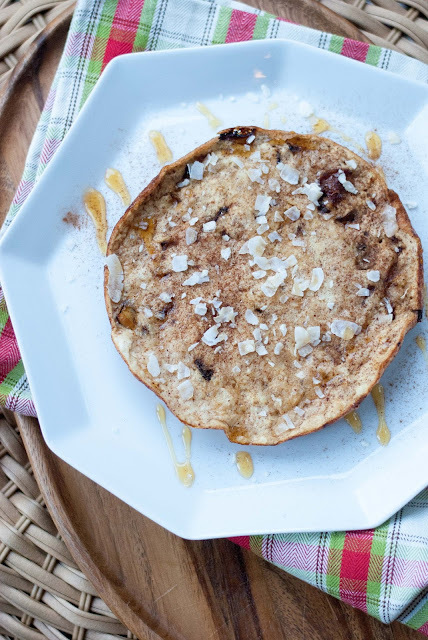 Remove with a spatula and top with honey, coconut flakes and a dash of cinnamon!